*In a big bowl add besan, sooji, hing, salt and sugar. You can store this mix in an airtight container and when ready mix in the ingredients mentioned under – “wet ingredients”. *De -seed green chilies. Using a motor pestle pound chilies and ginger to a fine paste. *Add oil, citric acid, freshly grounded green chili and ginger paste and salt. Add water and mix until well blended. 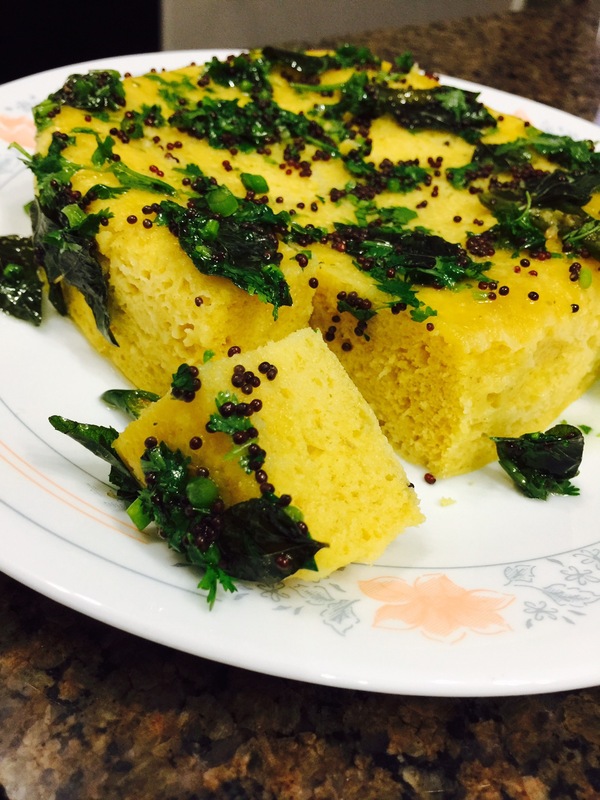 Beat the dhokla batter couple of times to incorporate air into it. 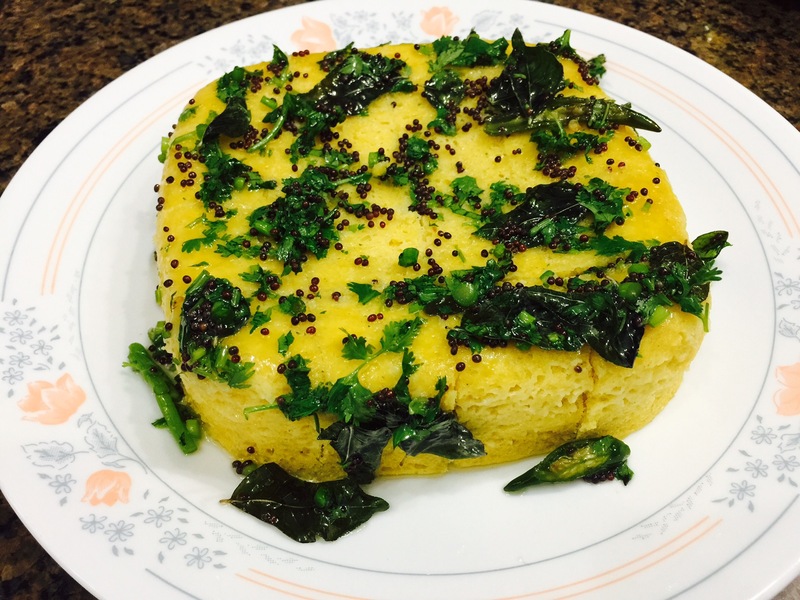 This is result into fluffy and light dhokla. This has to be done before adding eno. *Finally add eno and whisk the batter until it is well blended. Batter will become airy and frothy. *Grease a plastic Microvave safe container in which Dhokla will be cooked .Container should almost be double in size as the batter will rise up while steaming. Now microwave for 2 minutes, then for 1 minute and again for 1 minute. *Insert a toothpick to check if Dhokla is properly cooked. It should come out clean. Allow it to cool down for few minutes. Insert a knife around the edges to loosen up Khaman. Flip it over onto a plate. * Perfectly steamed Dhokla is ready for tempering. *In a pan heat oil, add green chilies and let it splutter on a low flame. Don’t fry green chilies on a high flame as they may explode leaving a mess. Add curry leaves and when they are crisp, add sugar and water. Mix it well.